Ultimate DVD cloner & DVD ripper, enables you to copy, clone or rip protected DVDs with high quality. Burn DVD9 to DVD9, burn DVD5 to DVD5 in 1:1 ratio, compress DVD9 to DVD5, copy DVD on hard drive as DVD folder / ISO Image File played by media player directly. 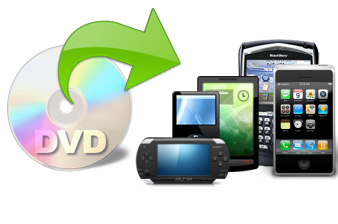 As a DVD Ripper, Any DVD Cloner Platinum can rip DVD movies to M4V, MP4, and MKV for playing DVD movies on iPod, iPhone, Xbox 360, PSP, ipad, and android devices like Samsung Galaxy Note, Samsung Galaxy S2 etc. - Remove/decrypt almost all known DVD copy protections, like CSS, RC, RCE, APS, UOPs, ARccOS, etc, to freely copy any DVD. - Help you decrypt protected DVD movies with perfect video and audio quality for better digital experience. - With Any DVD Cloner Platinum, you can decrypt and copy both NTSC and PAL DVD movies. 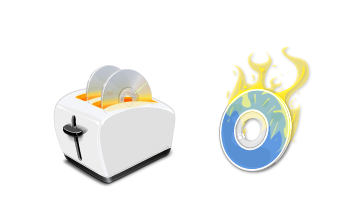 - Enable you to burn a single-layer (DVD-5) movie onto one single-layer D5 DVD+R/RW DVD-R/RW disc. Shrink a dual-layer (DVD-9) movie into one single-layer (DVD-5) DVD+R/RW DVD-R/RW disc. - Allow you to copy a DVD to your hard drive as a DVD backup folder. - It supports many DVD burner such as DVD-R / DVD-RW / DVD+R / DVD+RW. 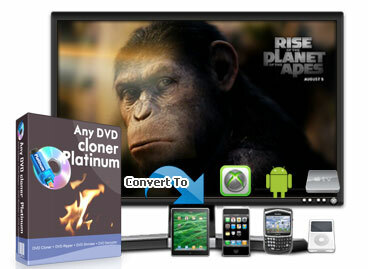 - Any DVD Cloner Platinum also performs as a perfect DVD ripper. You can rip encrypted DVD movies to many common video files including M4V, MP4, AVI, MKV, OGM. - It supports ripping DVD movies to popular portable media devices including iPod, iPhone, PSP, PS3, Xbox360, android phones, android tablets etc. - You can create video file with fantastic audio effect for your own preference. - Shrink DVD-9 movies and copy it to a regular DVD-5 DVD-R/RW or DVD+R/RW with excellent movie quality both in video and audio. - You can personalize your DVD movie by customizing any titles, chapters, main movies, menus, special clips, languages and subtitles to copy or shrink. - Support DVD-R / DVD-RW / DVD+R / DVD+RW burners. It works pretty well with DVD+-R/RW, DVD-RAM, most DVD players and burners. And there won't be scratched or damaged DVD any more and you can enjoy any DVD movie anywhere at any time. There are 4 easy and flexible DVD copy modes available to copy the DVD as you like.